Two suppliers of touch panels in Taiwan are anticipating a good first half of 2019, with the pair saying that they expect to supply screens for the fifth generation iPad mini and a new 2019 iPad. 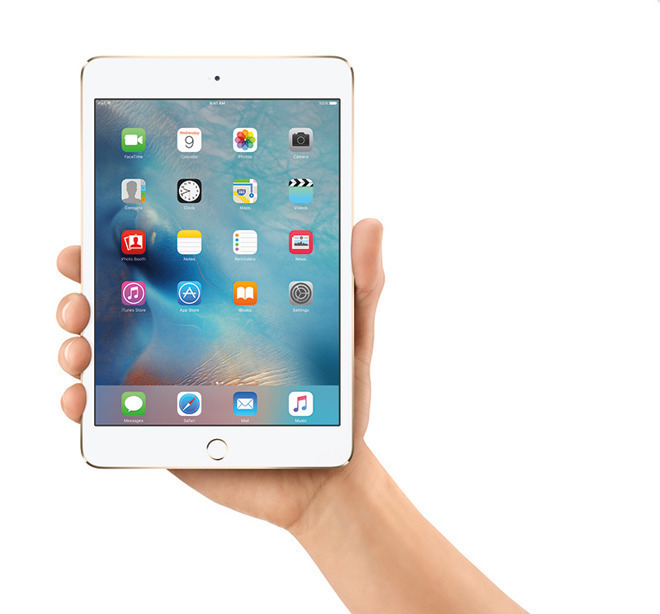 While the rumors of a new iPad mini model are relatively sparse, the impact of the rumors has led to a report claiming General Interface Solutions and TPK Holding will benefit from the updated pint-sized tablet's production, with the two firms said to be the suppliers of touch solutions for the device. According to sources of DigiTimes, GIS is like to provide the touch system for over 40 percent of new iPad devices in 2019. TPK and the China-based O-film Technology will apparently handle the remaining 60 percent of units, though it is unclear how the figures apply to the 2019 iPad and to the smaller iPad mini. It has been rumored Apple plans to bring out the updated 7.9-inch iPad mini in the first half of 2019, though it is unclear if there will be a major change in design to bring it in line with the iPad Pro's makeover. A 2019 iPad is also reportedly planned for launch, with a November story suggesting it will be remodeled with a larger 10-inch display and a narrower frame. In the fourth quarter of 2018, GIS posted record high revenues of NT$51.68 billion ($1.68 billion), with sources claiming 60 percent of its total sales stemmed from supplying touch solutions for iPads. DigiTimes has a decent track record picking out supplier's plans. However, the publications track record on Apple's specific product plans are charitably described as spotty. This report leans more towards the first class of report, however. While favorable, GIS is thought to see its overall sales cut by over 50 percent for the first quarter of 2019 compared to the last quarter of 2018, with the sequential dip expected to be due to seasonality. Report sources claim GIS will continue to keep its capacity utilization rate over 50 percent in the first quarter, as it is said to be preparing to increase shipments of in-display fingerprint reader modules, destined for use in the Samsung Galaxy S10 range. Everything since the original was released was a garbage and not good value update. I figured it was dead for good, but would love to update my ipad mini. It'll be interesting to see what Apple offers with the new iPad mini. I've really enjoyed my iPad mini 2. I have a 2017 MacBook and an SE as my main devices. I hardly use my iPad mini at all anymore. Except when I travel. The small size and weight is a winner! Have been waiting for this... will keep my current ipad mini for work. I'll buy one for about $199. When Apple set out to update the iPad Mini so that it could run the latest iOS and used in Apple Stores as marketing for the more important products, the big question the execs asked was "what is the least we can do". This new iPad Mini will embody the answer to that question. You mean the non retina original. I have to disagree.. I think the 2nd gen with Retina was the best value/update. That year they had the iPad Air and Mini 2 with the same screens and internals. I think that is how the Mini should be going forward.. same internals and screen as big brother. iPad Pro & Pro ( Mini ). Keep the value iPad @ 9.7. Maybe now that sales are down Apple will rediscover all the products they have been ignoring. I'd buy a new Mini ... the 4 is just barely able to run the app i want it for... so i bought a 9.7... but it's just to big for where I use it. I really want an up-to-date Mini. If it represents the same value to me then as it does now, yes. I have an original iPad mini. It works just fine, and I don't *need* an new iPad mini. Would I like one? Certainly. The value *to me* *without knowing more at this point* is about $199. I can buy a 9.7: iPad for $250. Why would a smaller one not be less expensive? I saw a AI headline extolling the value of an iMac Pro. The iMac Pro might be a great value *for someone else* *that values its capabilities* but I do not. I have an iMac I like that works fine for what I need now. I would replace it with an iMac Pro for about $800. That's the value *to me* *right now. * YMMV. I agree, one of the best features of the Mini 4 is the laminated screen, ...they should at least have a Pro version of the Mini, with Pencil support...Touch ID is fine, internals and screen are more important...just like some want a 12.9” screen and some want an 10.5/11” screen in a Pro model, some of us want the same in a 7.9” screen size. I also say keep the value iPad @ 9.7. The talk of a “cheaper” screen is my only reservation. I have the 4, and downgrading the screen from here would make what should be an easy sale to me, suddenly much harder to justify. Good point, K2...new SE, new Mini, a MacBook w/ slimmer bezels, larger trackpad and Touch ID, etc., etc. I've always leaned towards the 'consumer' Apple products as opposed to the more expensive 'Pro' level devices. Having a 2017 MacBook already, if my iPad broke, I'd wouldn't replace it. If my iMac broke, I won't replace it. If my my 2017 MacBook broke...I'd probably go 'all in' with iOS and not ever buy another MacOS device. I love and own Apple's ancillary devices, ATV, AirPods and AppleWatch.